In a beautiful setting at the foot of the Knockmealdown Mountains and along the banks of the River Suir, in scenic South Tipperary, you will have a unique opportunity, with other interested and motivated people, to experience the strong cultural heritage of Newcastle in our native tongue. The town is the ‘only’ (former) Breac-Ghaeltacht in all of Tipperary. 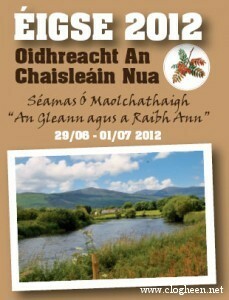 The Éigse Séamas Ó Maolchathaigh has proven extremely attractive and successful in previous years. Whatever activity you choose to be part of, an interesting and informative weekend is assured. Some of the activities you will find include readings, cookery demonstrations, fiddle-making and Tai Chi to name a few. You will find a full PDF document outlining directions, dates, times and activities on offer here.